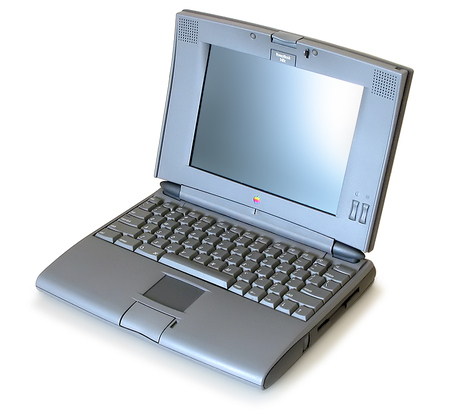 The PowerBook 500 series (codenamed Blackbird) was a range of Apple Macintosh PowerBook portable computers first introduced by Apple Computer with the 540c model on 16 May 1994. The 500 series was the first laptop computer to use a trackpad instead of a trackball as a built-in pointing device and the first to have Ethernet networking built-in. It was the first PowerBook series to use a Motorola 68LC040 CPU (simultaneous with Duo 280) and be upgradeable to the PowerPC architecture via a swap out CPU daughter card (with the PowerPC and 68040 upgrades for sale), use 9.5" Dual Scan passive color/B&W displays, 16bit stereo sound with stereo speakers, have an expansion bay, PC Card capability, two battery bays (and a ten minute sleep/clock battery), full size keyboard with F1-F12 function keys, be able to sleep while connected to an external monitor and have a battery contact cover included on the actual batteries. It included a single serial port which could be to connect to a serial printer or a network via Apple's LocalTalk. In another first, it also included a AAUI port for connecting to non-LocalTalk (usually Ethernet) networks. The first PowerBook (aside from the Duo, which is a special case) that could seriously make a claim to being a desktop computer substitute was the 500 series, code-named "Blackbird" after the at one time top-secret Lockheed SR-71 spy plane. While the PowerBook 500 didn't really have desktop power or expandability, it came closer than any laptop computer had up to that point, and was inarguable one of the best all around PowerBooks ever built within the context of its time.